The Burlington Birkenheadt 3 Tap Hole Thermostatic Mixer with Pop Up Waste has a traditional appearance, lovingly crafted and hand finished with exceptional care using the finest materials and manufacturing processes. The Burlington Anglesey 3 Tap Hole Thermostatic Mixer with Pop Up Waste has a traditional appearance, lovingly crafted and hand finished with exceptional care using the finest materials and manufacturing processes. The Burlington Claremont 3 Tap Hole Thermostatic Mixer with Pop Up Waste has a traditional appearance, lovingly crafted and hand finished with exceptional care using the finest materials and manufacturing processes. 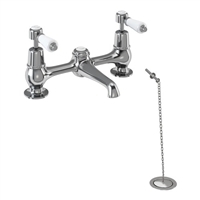 The Burlington Anglesey 2 Tap Hole Bridge Basin Mixer with High Central Indice with Plug and Chain Waste with Swivel Spout has a traditional appearance, lovingly crafted and hand finished with exceptional care using the finest materials and manufacturing processes. The Burlington Kensington 2 Tap Hole Bridge Basin Mixer with Low Central Indice with Plug and Chain Waste with Swivel Spout has a traditional appearance, lovingly crafted and hand finished with exceptional care using the finest materials and manufacturing processes. 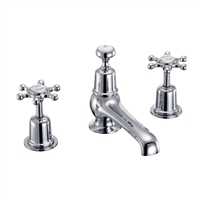 The Burlington Kensington 2 Tap Hole Bridge Basin Mixer with High Central Indice with Plug and Chain Waste with Swivel Spout has a traditional appearance, lovingly crafted and hand finished with exceptional care using the finest materials and manufacturing processes. 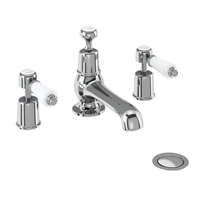 The Burlington Birkenhead 2 Tap Hole Bridge Basin Mixer with Low Central Indice with Plug and Chain Waste with Swivel Spout has a traditional appearance, lovingly crafted and hand finished with exceptional care using the finest materials and manufacturing processes. 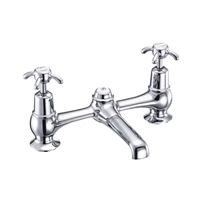 The Burlington Birkenhead 2 Tap Hole Bridge Basin Mixer with High Central Indice with Plug and Chain Waste with Swivel Spout has a traditional appearance, lovingly crafted and hand finished with exceptional care using the finest materials and manufacturing processes. The Burlington Claremont 2 Tap Hole Bridge Basin Mixer with High Central Indice with Plug and Chain Waste with Swivel Spout has a traditional appearance, lovingly crafted and hand finished with exceptional care using the finest materials and manufacturing processes. The Burlington Claremont 2 Tap Hole Bridge Basin Mixer with Low Central Indice with Plug and Chain Waste with Swivel Spout has a traditional appearance, lovingly crafted and hand finished with exceptional care using the finest materials and manufacturing processes. 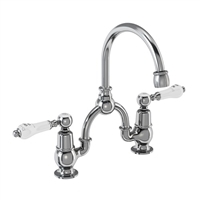 The Burlington Kensington 2 Tap Hole Arch Mixer with Curved Spout (230mm centres) has a traditional appearance, lovingly crafted and hand finished with exceptional care using the finest materials and manufacturing processes. The Burlington Kensington 2 Tap Hole Arch Mixer with Curved Spout (200mm centres) has a traditional appearance, lovingly crafted and hand finished with exceptional care using the finest materials and manufacturing processes. The Burlington Birkenhead 2 Tap Hole Arch Mixer with Curved Spout (230mm centres) has a traditional appearance, lovingly crafted and hand finished with exceptional care using the finest materials and manufacturing processes. The Burlington Birkenhead 2 Tap Hole Arch Mixer with Curved Spout (200mm centres) has a traditional appearance, lovingly crafted and hand finished with exceptional care using the finest materials and manufacturing processes. 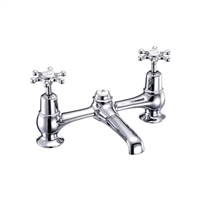 The Burlington Anglesey 2 Tap Hole Arch Mixer with Curved Spout (230mm centres) has a traditional appearance, lovingly crafted and hand finished with exceptional care using the finest materials and manufacturing processes. The Burlington Anglesey 2 Tap Hole Arch Mixer with Curved Spout (200mm centres) has a traditional appearance, lovingly crafted and hand finished with exceptional care using the finest materials and manufacturing processes. The Burlington Claremont 2 Tap Hole Arch Mixer with Curved Spout (230mm centres) has a traditional appearance, lovingly crafted and hand finished with exceptional care using the finest materials and manufacturing processes. 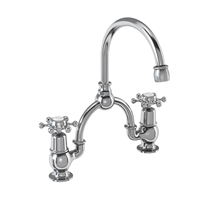 The Burlington Claremont 2 Tap Hole Arch Mixer with Curved Spout (200mm centres) has a traditional appearance, lovingly crafted and hand finished with exceptional care using the finest materials and manufacturing processes. 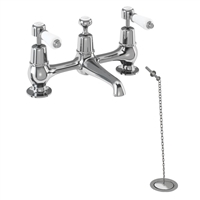 The Burlington Anglesey 2 Tap Hole Bridge Basin Mixer with Low Central Indice with Plug and Chain Waste with Swivel Spout has a traditional appearance, lovingly crafted and hand finished with exceptional care using the finest materials and manufacturing processes. The Burlington Kensington 3 Tap Hole Mixer with Pop Up Waste has a traditional appearance, lovingly crafted and hand finished with exceptional care using the finest materials and manufacturing processes. The Burlington Birkenhead 3 Tap Hole Mixer with Pop Up Waste has a traditional appearance, lovingly crafted and hand finished with exceptional care using the finest materials and manufacturing processes. 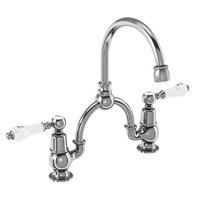 The Burlington Claremont 3 Tap Hole Mixer with Pop Up Waste has a traditional appearance, lovingly crafted and hand finished with exceptional care using the finest materials and manufacturing processes. 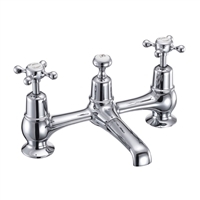 The Burlington Angleseyt 3 Tap Hole Mixer with Pop Up Waste has a traditional appearance, lovingly crafted and hand finished with exceptional care using the finest materials and manufacturing processes.